It's the pool party games make a pool party fun and memorable. We like action at our pool and it's often the games that kids, especially, fondly remember. There are games for all ages and for all swimming abilities. 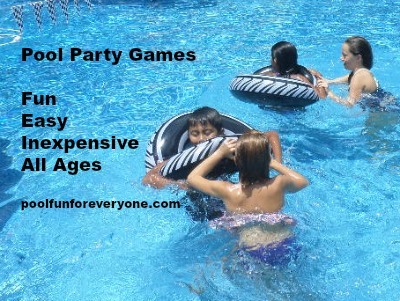 Many of our swimming pool games are geared toward the theme of the pool party. Dive for sunken treasure at a pirate pool party or Feed the Lion at a Lion King party. Toss frog splash balls at a frog themed party. Perform a mermaid rescue or swim through Nemo hoops at an Under the Sea Pool Party. However we have lots of pool games ready to play for a casual afternoon of pool fun. Which swimming pool games to play depends on the age of the players and their ability to swim. However there are games that don't require the guests to get completely submerged in the water - like Jarts or Skip'n Sink Disk Toss game. Get your kids, teens and adult guests into the pool with these pool fun ideas. 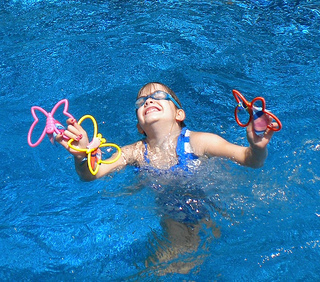 Pool games for kids need to accommodate the age and skill level of the child. The games can be geared toward the theme of the party - like a pirate ship game for a Pirate Pool Party or finding Nemo games for an Under the Sea celebration. Simple props like swim rings, foam noodles, splash balls or pool floats add creativity and energy to swim races and activities. 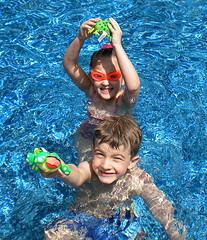 Swimming pool diving games provide lots of fun and excitement - gathering lost coins or treasures for your pirate party games or finding Ariel's favorite trinkets at the "bottom of the sea." We found butterfly dive rings for our Bullfrogs and Butterflies pool party and these sea creature dive sticks for our Under the Sea pool party. Play on teams or individually, you can add different challenges to adjust to the kids ages and skill level. Looking for some fun pool games for your teens? Here are some swimming pool games that we have enjoyed in our backyard pool. Teenage pool party games include your typical volleyball, football or basketball game, or some fun themed relays. Consider the age and the gender of the guests and if your friends plan on getting wet or just want to keep cool in the pool. With 5 boys all around the age of 11 I don't think I've seen more fun than with this inflatable pool basketball game. 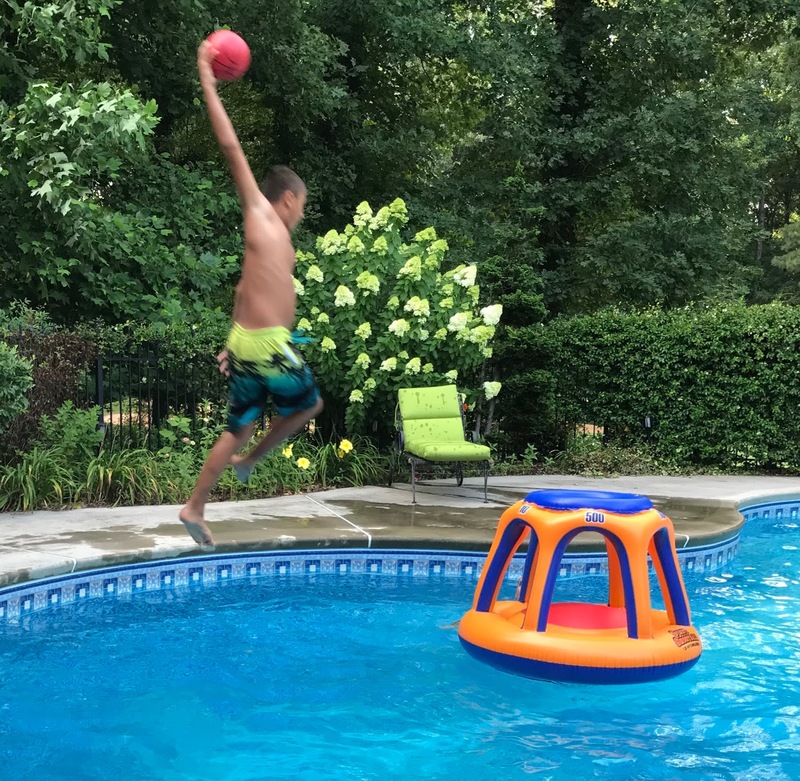 Epic shots from the diving board, more than just the basketball landed on this pool toy. Inspite of tons of abuse this tough guy never lost any air and kept the pool party fun all evening. We also got an extra pair of pool basketballs which gave the opportunity for more boys to play at the same time. With a little planning and a few props your guests will have fun in and out of the pool and wonder when they'll be invited to your next pool party.